UTX Analytics Audit is a FREE tool to help you get the most out of your website. In 30 seconds you'll see a detailed report on what you're doing right (and wrong) in your Google Analytics account. Everything in IT moves fast. Web analytics is no different. If you're one of the 80% of websites that uses Google Analytics to track and measure traffic then there are changes coming out every couple of months. 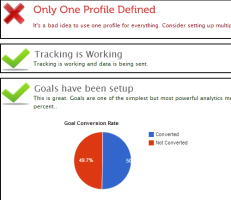 When did you set your analytics up? One year ago, two? If you haven't reviewed it since then you're out of date and you're missing out on new features which can help you rank better, get more happy visitors and sell more. You shouldn't need to be an analytics nerd to keep up with the latest must have feature. Which is why we've built this tool. It checks your analytics account and website code and then tells you what you're doing well and what you're missing out on. Got social buttons but not using the latest social tracking in your analytics account? You'll politely be informed. Didn't even know about the latest version of the tracking code? The tool will tell you. Don't have any goals setup? At this point it might become a bit passive aggressive. We don't see any of this data so we won't snicker at your 'cool' 2009 version tracking code or your 'unusual' use of utm tags to track social because you read that blog article in 2011. Click the button to generate the report. You'll first be redirected to your google account login. You'll need to accept the prompt to grant us temporary read-only access to your google analytics data. We don't store or make use of your data in any way but we will send you a quick email to ask how you liked the report. You need to have a google analytics account to make use of this service.